Looking for the SEO Checklist and Cheatsheet for Websites and Blogs? Download a Printer Friendly SEO Checklist and Cheatsheet Word Doc you can store on your computer and take with you on the go. Just about anyone who has done at least a little bit of research into niche blogging or online freelance writing knows of how important it is to find the best keywords. But what a lot of people new to the scene don’t know is how exactly to find which keywords are the most profitable. If you want your article or website to make the most of Google Adwords, follow the tips in this article to maximize your earnings. Using Google Adwords “Keyword Tool” to the right keywords to blog about or optimize your website’s SEO around is crucial. What if you are using “Keyword+A” when in fact, it has little search traffic and potential to profit? It would be so much better if you could type “Keyword+A” into a tool and have them tell you “Keyword+B” or even “Keyword+C” would be better. Well that is exactly what the Google Adwords Keyword Tool does and so much more. If you are a Google Adsense publisher you can use this information to find and blog about topics people are searching for, so your website will get seen more and have more of an opportunity to display Google Adsense ads and make money from online advertisers. 1. List a group of topics you are knowledgeable about and would like to consider using. 2. 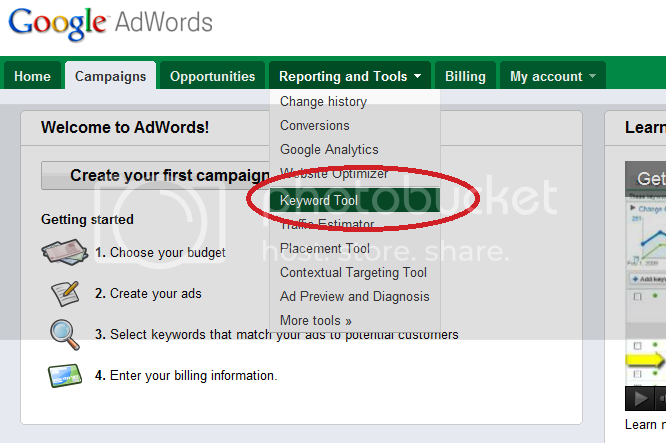 Click on the Google Adwords Keyword Tool by logging into your google adwords account at www.google.com/adwords and going to REPORTING AND TOOLS > KEYWORD TOOL in the drop-down menu. Enter your keyword or keyword phrase into the Keyword Tool search box on the next page. You could also choose to enter a website you want to compete against or a particular category to find keyword ideas as well. Select the checkbox that says “Only show ideas closely related to my search terms” and click on “Search” button. 3. Typically, a long list of keywords will populate. You’re going to want to display three columns; everything else you can hide. Using the drop-down menu, make sure that “Estimated Avg. 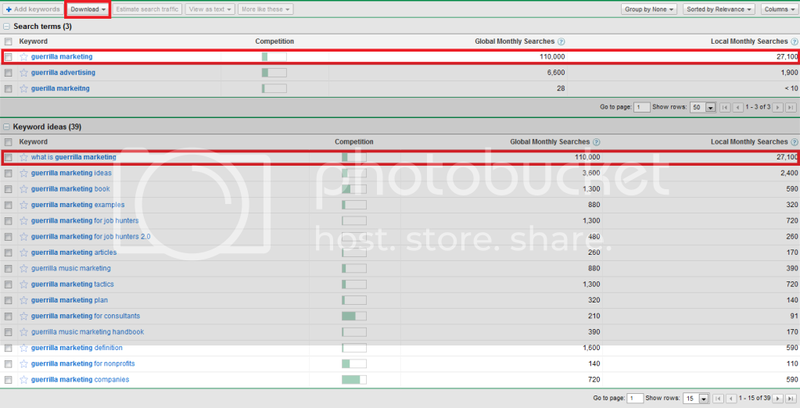 CPC”, “Advertiser Competition” and “Global Monthly Search Volume” are all displayed. This is also useful information for when you are searching for topics to blog about or optimizing your website. The higher the CPC, the more advertiser’s are willing to pay for that keyword. The higher the Global or Local Monthly Searches, the more people who are searching for that keyword. 5. Review your keyword’s advertiser competition. To do this, simply mouseover the green/teal bar next to your keyword, and a ranking will pop up. The rankings can vary from ‘no advertiser competition’ all the way to ‘very high advertiser competition’. The best keywords are those who are rated as having anything at or above a high advertiser competition. This means that lots of advertisers are competing for this word, meaning that you will typically have a wealth of high-earning, related ads displayed on your article, website or blog. 6. Lastly, take heed of the global monthly search volume. This will give you some idea of how often people are searching for your word. While many people speak of the importance of making money off of ‘niche’ topics, don’t be afraid of a high search volume: if you advertise your article or website and do proper SEO, you can get to the top of the search engines and — if you have quality information — beat out the competition, thus gaining the majority of those ad clicks for yourself. At the same time, however, a high-earning niche topic can definitely be the way to go. At this point, you’d want to size up your competition to decide what the best route to take is. 7. Implement your chosen keywords into your article, website or blog, making sure not to ‘over-stuff’ them (6-12 keywords is what I’ve heard to be best practice). If using ‘All In One SEO’ for WordPress, you’ll want to put these keywords into the ‘Keywords (comma separated):’ section of the plugin. Whenever using keywords also make sure that your writing still sounds natural, so as not to alienate readers: it’s useless to spend all that time researching keywords only to have no one take the time to read what you’ve written.